When London office worker Richard Mayhew helps a mysterious young woman who appears on the sidewalk in front of him, he finds himself drawn into the depths of London Below, a sinister realm full of monsters and magic. In his quest to help the Lady Door discover who murdered her family, Richard must battle a beast, match wits with a pair of Victorian assassins, and survive an ordeal that forces him to question his very sanity. Along the way, Richard discovers that, despite all indications to the contrary, he might just be a hero. Poster by Okanagan College Writing and Publishing student Rachelle Fraser. Monsters, magic, mayhem and a reluctant hero are on the agenda as Okanagan College's Red Dot Players bring Neverwhere to the stage at the Kelowna campus beginning March 8. The story focuses on a London office worker, Richard Mayhew, who helps a mysterious young woman who appears on the sidewalk in front of him. Mayhew is drawn into the depths of London Below, a sinister realm brimming with monsters and magic. As he helps the Lady Door discover who murdered her family, Mayhew has to battle a beast, match wits with a pair of Victorian assassins and survive an ordeal that forces him to question his very sanity. And – along the way – he discovers that despite all indications to the contrary, he might just be a hero. 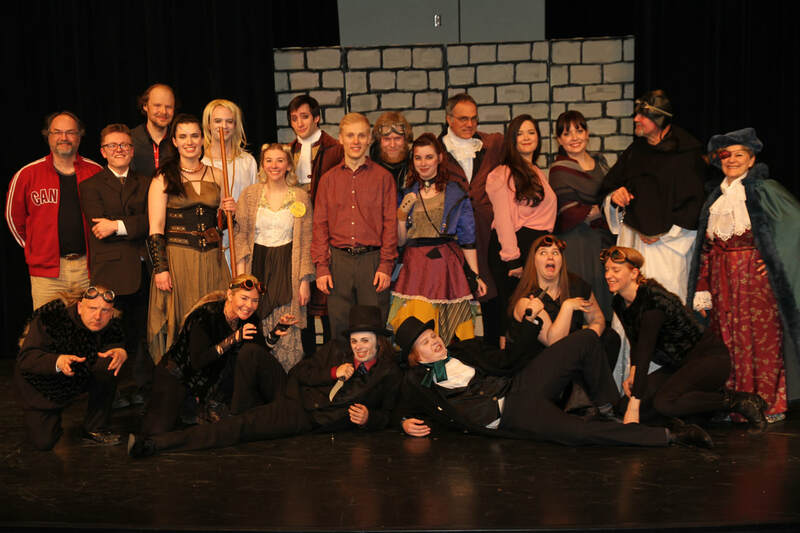 The Red Dot Players are a theatre troupe for Okanagan College students, employees, and community members, sponsored by Arts and Foundational Programs at Okanagan College and based in Kelowna. The troupe’s mission is to produce plays that entertain, challenge, and educate audiences; to provide Okanagan College students and employees with an opportunity for creative self-expression; and to contribute to the arts in the Okanagan Valley. 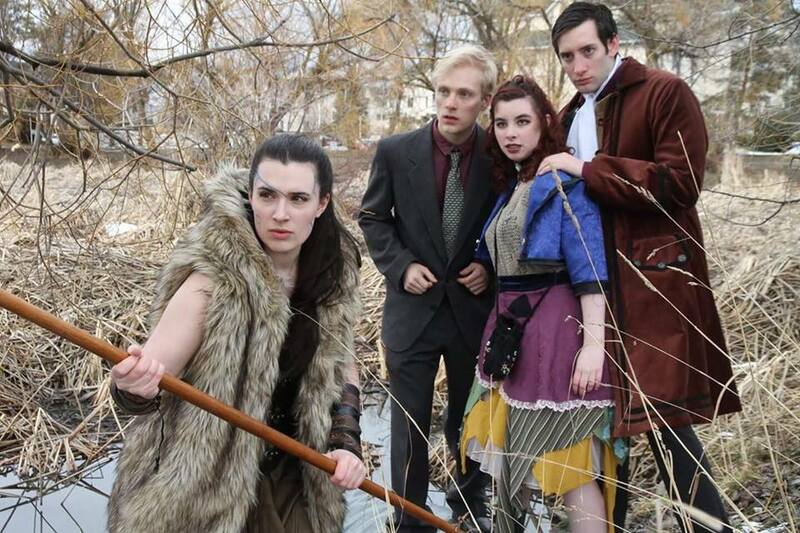 Performances of Neverwhere are taking place on Thursday, March 8, at 7:30 p.m.; Friday, March 9, at 7:30 p.m.; Saturday, March 10, at 7:30 p.m.; and Sunday, March 11, at 2 p.m. at the Okanagan College Theatre (1000 K.L.O. Road). Tickets are $18 for adults, $15 for students and seniors and are available at Mosaic Books and the Okanagan College Campus Store. They will also be available at the door. Since starting in 2010, Red Dot Players have produced seven plays: The Beaux' Stratagem (2011), Blithe Spirit (2012), Les Belles-Soeurs (2013), The Government Inspector (2014), The Black Bonspiel of Wullie MacCrimmon (2015), A.K.A. Fangirl (2016), and Sense and Sensibility (2017). All photographs by Denise Johnson.